I heard a whisper that this camera may be ready very soon. What a privilege we have, to watch and enjoy. Thats great news Jo. But,what news of our beloved Seal-cam ?... :peek: Has anyone learned to walk on water yet ? I am looking forward to this camera! How is the weather in Estonia now? We know there is no (or hardly any) snow at the pig cam and also Käsmu and I have heard that Tallinn had snow, but it went away again. I don't know where the feeding place is, maybe it snowed already there? hip hurray! i've been so waiting for this! let's hope that the weather turns cold, too. I think you are right, ame. I don't know what the weather is like there. Can you remember which ILM weathr forecast we used to use? "The feeding place is in the Silma wetland area in western Estonia. The NGO Silma Wetland is supported by KIK, the Estonian Environmental investment Centre." 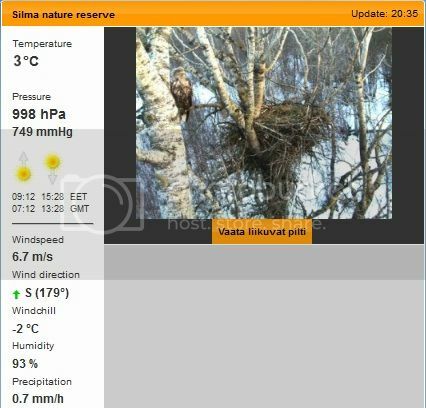 so i think it must be the same weather station as our favourite WTE couple's home weather station Silma looduskaitseala. the current weather data dos not look very promising. it seems to be about the same as elsewhere in Estonia: relatively warm and wet. Thank you for doing that investigation, ame! So it is likely to be a wet and muddy, messy feeding ground this year. Weather often changes immmedaitely after Christmas, in UK. I like that cam . I hope many eagles will come and I am hoping for snow, it looks beautiful when everything is covered by snow. I am waiting for the winter feeding cam, too. In the meantime, here is a holiday greeting from the Decorah, Iowa, USA, bald eagles from earlier today. First to arrive is Mom, then a few moments later, Dad. Perhaps the weather was not the right to feed the eagles for watching. But perhaps its getting colder, freezing and snowing and then the eagles will be happy to get food and the managing people will open a cam for watching. 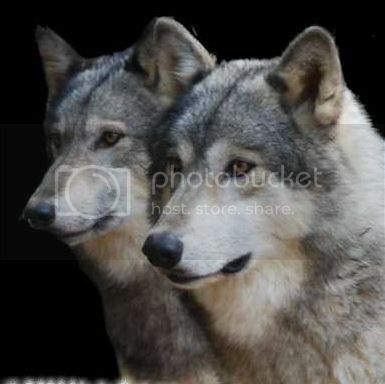 We would be very happy about it - we friends of this and other animals (like foxes with thick and thin tails and ravens). Bleggi, thak you for your optimism. I was beginning to wonder if the "whisper" I heard had faded away into the mist! I can say to all of you that it will be the best cam in our forum! Soon you all can see it! I hope that soon will be here many eagles, foxes and of course ravens and crows. Opening of this cam is very close! Mutikluti wrote: I can say to all of you that it will be the best cam in our forum! Soon you all can see it! I hope that soon will be here many eagles, foxes and of course ravens and crows. Opening of this cam is very close! Here is what we have all been waiting for - the new webcam. This is a Pan Tilt Zoom camera which Mutikluti will operate for us. There is nothing to see today, in morning was there one young WTE for a while but it left. I hope that soon will be colder and then there will be food for birds and then it will be very interesting to watch for us all what will going to happen there.